4100 State Rd. 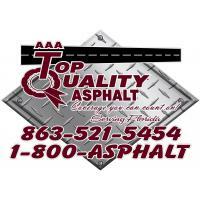 60, E.
AAA Top quality asphalt is a highly qualified full service asphalt paving company. With over 40 years of combined experience in the asphalt industry AAA Top Quality Asphalt has the experience and equipment to effectively and efficiently complete every project. Since 2001 Top Quality Asphalt has strived to become Central Florida’s leading paving and maintenance contractor and even though this is not an easy task it is one that has been accomplished through attention to detail, professionalism, and hard work. AAA Top Quality Asphalt, located Mulberry, Florida, offers an extensive amount of asphalt paving and maintenance services throughout the central Florida area. From small asphalt repairs and seal coating to asphalt milling and DOT paving projects AAA Top Quality Asphalt is central Florida’s #1 choice. AAA Top Quality Asphalt is fully licensed and insured and all work is guaranteed. We continue to build our company on the initial principles that were the foundation for this company which are: hard work, dedication, quality products and most of all customer satisfaction! It is more important now than ever before to carefully spend capital expenditures effectively. To achieve this, partnering with a qualified contractor that can provide an accurate consultation and flawless execution is critical. As our country tries to work its way out of a trying economic time, the demand for high quality maintenance and paving contractors has increased exponentially. AAA Top Quality Asphalt witnesses this on a daily basis as our clients seek our knowledge and expertise to complete their project the first time in the most cost effective and economic way.